SSDA is very sad to announce the passing of Dr. David Evans, one of the Founding Fathers of our organization. Dr. Evans helped form SSDA in 1983, and since then he worked tirelessly to make SSDA the viable organization it is today. Not only was he a true champion for small school districts, he was also a beloved mentor and friend. He will truly be missed. 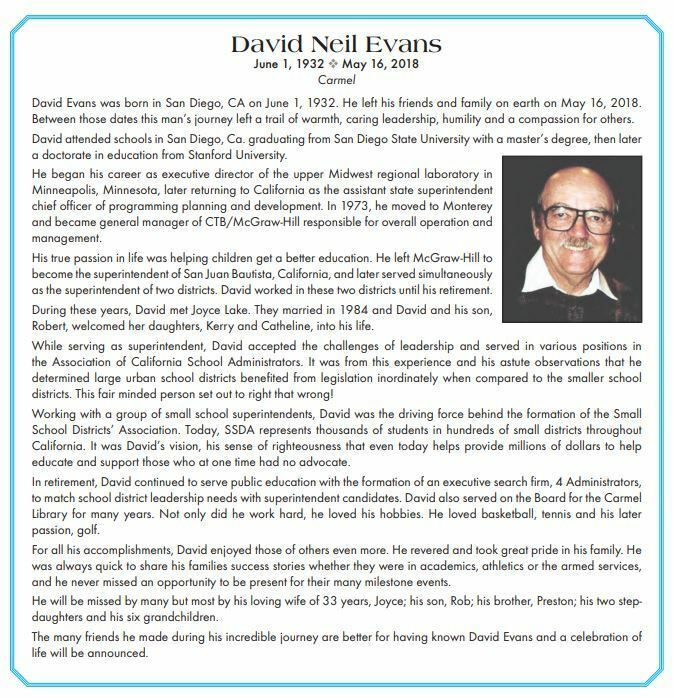 Below is a copy of the obituary for Dr. Evans printed in The Carmel Pine Cone. As we will be paying tribute to Dr. Evans in Fall/Winter 2018 issue of SSDA Today! magazine, we invite you to send your thoughts, stories and photos to corrie@ssda.org.